I took the train from Paris to Bruges, Belgium the day after Christmas. I had a day and a half to experience the quaint city that, to me, appears to have stepped out of a fairytale. Unfortunately, my travel camera charger succumbed to the rain in Paris, and my camera died after I snapped only four photos of the medieval city. I was able to capture a nice aerial view of the main square, Markt, with it's one of a kind architecture and brightly colored buildings. In the center of Markt, people were still celebrating the Christmas season, taking advantage of the giant ice skating rink and Christmas market. 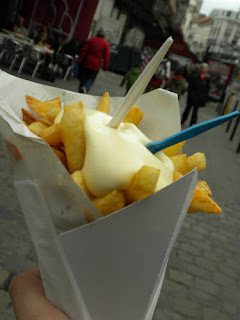 The smell of freshly fried frites wafting from the food stands hit me like the train that brought me to Belgium! Belgian frites come hot, greasy, and poked with a miniature fork so you can pretend to feel sophisticated while you devour them. They also come with over 20 different kinds of mayonnaise based sauces. I'm from Utah where the mixture of mayo and ketchup we fondly refer to as "fry sauce" is king. I described this sauce to a Belgian and he replied, "Oh, you like cocktail sauce?" I was confused, thinking my frites would come slathered with the tomato and garlic sauce I love to eat with shrimp. However, after my frites were lifted from the fryer, I watched as they received a generous squeeze of my beloved fry sauce. Whatever you like to call it, fry or cocktail, the combination of the famous sauce from home and fresh Belgian frites was out of this world! Another great street food staple in Bruges is the Belgian waffle. The batter they use is thicker and almost dough-like compared to the US version. It's cooked exactly the same way as in America, but the final product is a more dense waffle that comes encrusted in granulated sugar. As if that isn't enough of an improvement on the waffles I grew up on, my Belgian waffle came drizzled with dark chocolate sauce and topped with whipped cream. They also provided a mini fork for attempted daintiness while consuming. And, of course, there's the Belgian chocolate. It puts Hershey's to shame and makes you consider morbid obesity as a future life goal. I told the shopkeeper I wanted one thing, but I wanted it to be the best. She appreciated my gusto for her chocolate-making, laughing a little at the expense of my enthusiasm. She gave me a dark chocolate covered hazelnut crème. If I hadn't been traveling by Ryanair with their ridiculously strict carry-on policy, I would have bought an early Valentine's Day pound of chocolates for myself. They would not have made it through January. The most unique and not too historically significant thing I did in Bruges was attend their annual ice sculpture festival. Each Christmas season they choose a different theme and spend weeks carving enormous blocks of ice with chainsaws and picks to create a labyrinth through which thousands of bundled-up spectators walk and admire. This year, the theme was Lord of the Rings, but to avoid paying for that trademark, they settled on generic fantasy that resembled Lord of the Rings as closely as legally possible. There was an "Evil Eye" that looked over the castles, "dwarf mines," and "walking tree forests." It was below freezing inside so my visit lasted just over 15 minutes! It was overpriced, but how many times does a girl get to visit to tiny Bruges during Christmastime in her life? I think once, if she's lucky!